Los Angeles Graffiti: What Is Beauty? This is the topic that "Beauty CULTure", the current exhibit at The Annenberg Space for Photography, asks its viewers. The exhibit features photographs from many famous photographers, all with a different take on beauty. Some of my favorites are a diagram that dissects what makes a pin-up model a pin-up model and a collection of different celebrities' takes on the Marilyn Monroe look. "Through different lenses focused on the body beautiful, the exhibition examines both traditional and unconventional definitions of beauty, challenging stereotypes of gender, race and age. It explores the links between beauty and violence, glamour and sexuality and the cost (in its multiple meanings) of beauty." This exhibit is really interesting as it shows the change over time in what society deems to be beautiful and not beautiful. There is also a documentary that plays throughout the day that shows the cult-like glorification and pursuit of female "beauty". It's fascinating to see what the mass media and advertising is shoving down our throats as "beautiful", all for the sake of selling us more beauty products. 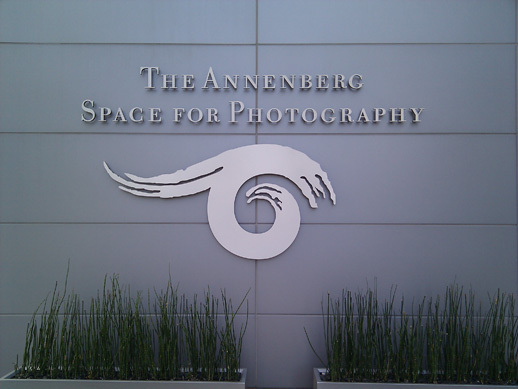 The Annenberg Space for Photography is located on the campus of Creative Artists Agency (CAA), home to some of the most powerful agents in Hollywood. 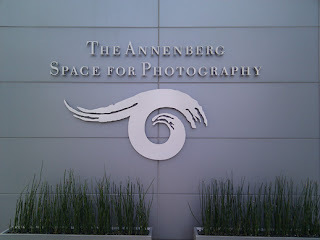 You'll park in CAA's parking structure and walk through its lobby to access the Annenberg Space for Photography. You might even spot a celebrity having a cup of coffee on the lawn as you ascend the steps to the museum. Admission to the Annenberg is always free. If you arrive in the parking structure after 4:31 pm (yes, the sign actually says 4:31 pm) then parking is only $1 for the evening. Make it a date night as the Century City Mall is just down the street and is filled with shopping, dining and possibly a free outdoor summer movie. Go see Beauty CULTure and post your thoughts in the comments below!